Designed for quick mobilization and set up. These cranes are road-ready and can be dispatched quickly to allow for being hook-ready on the same day as mobilzation to the site. These cranes can be assembled in numerous configurations to meet your specific project needs. Construction hoists are utilzed to increase productivity and reduce labor hours for multi-story construction. Going up? Designed to lift and carry, Crawler Cranes are perfect for less than perfect jobsite conditions. Rough Terrain Cranes, or RT Pickers, are a subclass of a hydraulic crane. As a self-propelled crane mounted on an undercarriage with four or six rubber tires, rough terrain cranes are specifically designed to operate on off-road and rough applications and surfaces. The perfect class for those tough to reach spots or last minute curveballs thrown your way, our Boom Trucks can be dispatched and hook-ready when you're in a pinch! Our forklifts and carrydeck cranes allow for surgical percision in the tightest spaces. Whether you are unloading trucks, or lifting within confined spaces, this class provides ample lifting tonnage without taking up a lot of space. Keeping your job safe and efficient always comes down to having the right tools. 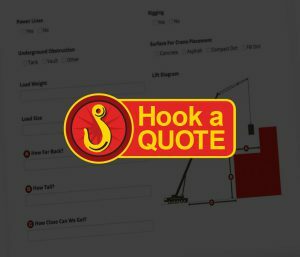 We carry a wide variety of hoisting and rigging supplies that ensure the job will be Raised Right!